Life with Lynnie: 70? Wow! What an Anniversary! Here on Life with Lynnie (LwL), I've discussed how supportive I believe we need to be of our veterans. Today, is one of those days. Today, is the 70th anniversary of the D-Day Invasion, that happened along the coast of France. My dad participated and served in both France and Belgium, on mainland Europe. Of course, this was after being stationed in England, and spending time both there, and in Northern Ireland. Some of you may recall me posting photos in the past, of Juno Beach area, in Normandy, France. 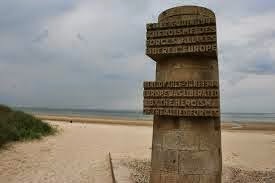 While the beach itself we call Juno Beach, where the Canadians landed, the actual town name is Courseulles-sur-Mer. I still have the pics in my photo album stored away. For some reason those pics that I had saved on my computer, were lost on my system. Rather than dig them out again and scan them, since it would be hard for me to do this physically at the moment, I decided to search online for pics. 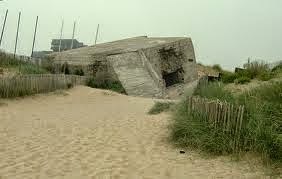 All along the beach front, there are still German bunkers. I recall feeling nervous even walking by this one. This tank was located in the town's main square. It was one of the first tanks offloaded during the invasion, but sunk in water that was too deep. Close to 27 years later, when my brother was in the Canadian Army (RCEME), servicemen of various types were able to drag it out of the water, and restore it. This German anti-aircraft gun was located in the town square, when I last saw it. 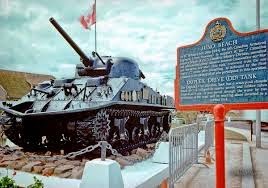 Now, it appears to be outside of the Juno Beach Centre. Just so you know, the German firing that gun was killed. 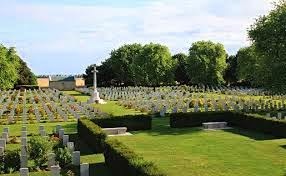 This is a nearby cemetery where only Canadian Army victims are buried. Just so you know, I've been to visit Courseulles-sur-Mer several times. 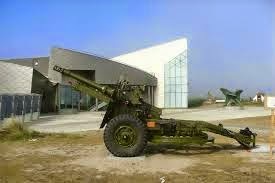 However, I've never yet seen the Juno Beach Centre, as it was in the process of being built, the last time I was there. On my next visit, I will be sure to visit the museum. If you know me personally, or have gotten to know me through LwL, you'll be aware about how important I feel it is to support those who have fought for our freedom. Without freedom, we would not have the life we have, today. After all, as you can see from the last photo posted, that many Canadians gave up their lives for our freedom. Not all who fought in Europe, died. My dad survived. And, so did others, who went fighting to end WW2. But, many died. We must be thankful to all who stood for freedom. Although those who died, gave up their lives for us. Thinking about this, brings to mind John 15:13, "Greater love hath no man than this, that a man lay down his life for his friends." I praise God that He provided. He provided people to love others. To love others enough to stand up and fight for freedom. And, while all risked their lives, some lost their lives. Back then, during WW2. And, even now. We have military people who risk their lives, daily. And, many have given laid down their lives, for our freedom. It's too late to pray for them, concerning where they will spend eternity. That decision is made before we take our last breath, here on earth. So, if you haven't yet come to Christ, trusting Him for your salvation, please do so, today. Always remember, Jesus gave up His life for you! Honour Him, by trusting in Him, before it's too late.